“History is the present. That’s why every generation writes it anew. But what most people think of as history is its end product, myth”. The best part with this quote was that I could link it with my memorable tour to Khajuraho in Madhya Pradesh with my colleagues. We planned a two day trip to Khajuraho in the mid of August when the city was receiving heavy rainfall. 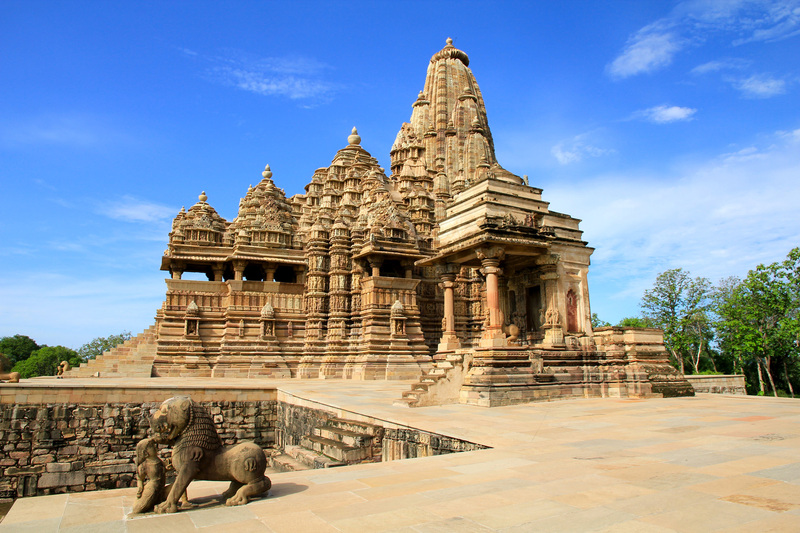 Khajuraho is a city that combines history, architecture, culture and divine greenery with delectable charm. We were booked in Hotel Usha Bundela. After enjoying a refreshing bath in the swimming pool, we headed for the Western Group of Temples. Yogesh, a travel assistant accompanied us throughout the tour. He told us that most of the temples were built between the 9th and 11th centuries by the warrior kings of the Chandela dynasty. We all were completely stunned to see the marvelous structure and exquisite sculptures there. People believe that these temples were built by the first Chandela raja to atone his mother’s sin, whose consummation with the Moon god heralded the start of the Chandela dynasty. Contrary to this, some believe that the temples were built as wedding chariots for the gods who came to attend the wedding of Lord Shiva, which is celebrated every year on the occasion of Shivaratri. The main temple wonders in the western belt were Chaunsat Yogini (dedicated to goddesses Kali), Kandariya Mahadeo (dedicated to Lord Shiva), Lakshmana Temple, Temple of Vishvanath and Nandi, Temple of Devi Jagdamba and other important temples of Lakshmi and Varaha, Mahadev, Chitragupta, Parvati, and Matangesvara. We stopped for a quick bite, and then explored the Eastern & Southern Group of Temples, which were equally impressive. The best among those were the temple of Parsvanath, temple of Brahma and Hanuman and Chaturbhuja Temple. We captured the astonishing beauty of these structures in our cameras. In the night, while having dinner, we enjoyed beautiful dance performances that showcase the culture of Madhya Pradesh. Next morning, we left for excursions. Our first halt was the renowned Raneh Waterfalls in the outskirts of Khajuraho. Yogesh told us that Raneh highlights the best of its beauty during monsoons, and it was really spell binding. We spent a couple of hours there in photography. Later, we also paid a short visit to Benisagar Lake (7 km). We had never thought that the forested plains of Bundelkhand in the heart of India could be so scenic, and pollution free. My entire team looks for complementary accommodation, food & transport on every trip. But Khajuraho was simply beyond our expectations. Even if it wasn’t a complementary trip, it would have been worth watching architectural wonders of the Bundelkhand region on our own expenses.